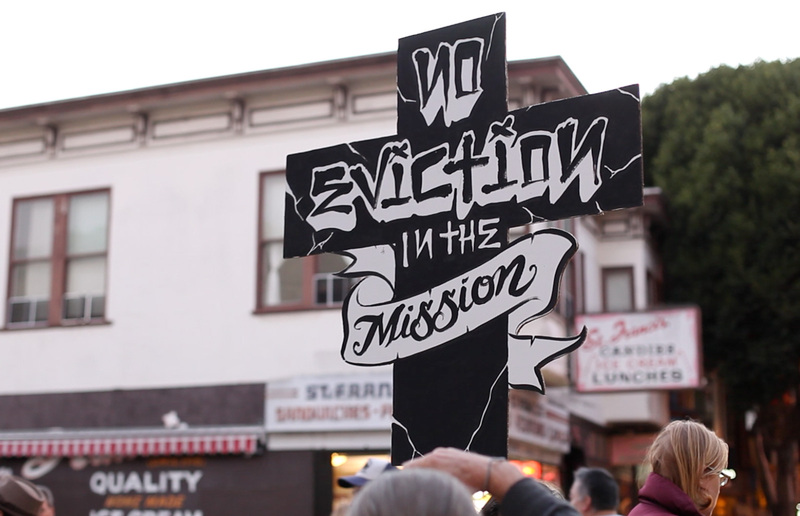 The Anti-Eviction Mapping Project has a new report out today investigating the role vacation rental companies like Airbnb and VRBO play in San Francisco’s housing market. As you might expect from the activist organization, the report offers a grim picture of the effect these “sharing economy” services have on the city. The report uses data the group has gathered over the past two years as well as demographic data released by the companies themselves, among other sources. It argues that the economy of short-term vacation rentals primarily benefit already wealthy property owners and exacerbates the housing shortage. “The sharing economy represents the loss of hard fought tenant and labor gains, heightens levels of social inequality and increases the grip of the market in new spheres of social life,” states the report’s conclusion. According to the report, the number of vacation rentals are growing and taking permanent housing units off the market. In tracking listings on VRBO, the Mapping Project found that 290 listings were added between August 2012 and July 2014. The report states that many users of these sites own multiple properties and use vacation rentals as their primary business. In their study of VRBO, the Mapping Project found that 31 percent of the owners of those buildings owned multiple properties. A similar percentage was found in a report by the San Francisco Chronicle on Airbnb ownership earlier this year. The report argues that many tenants renting out spare rooms aren’t doing so because they’re in need of spare cash—they’re already well off. Citing Airbnb’s own data, the report points out that 59 percent of hosts in San Francisco make over $70,000 and 40 percent of hosts earn over $100,000. The working class Latino heritage can still be felt in the restaurants, festivals, and murals, but housing opportunities are being rapidly gobbled up as pied-à-terre, and by affluent newcomers, who prefer lively neighborhoods over gated suburban communities…. Everyday people that made San Francisco (and the Mission) attractive as a tourist destination and a place to live, find themselves priced out. The report doesn’t have any specific policy recommendations, but offers the resounding opinion that these vacation rental services are bad for the city. Interesting how they try and sidetrack the issue that many Airbnb hosts are tenants by claiming that such tenants are wealthier (which they bizarrely define as making over 70K a year, which is below the SF median income). They also attribute the increase in the number of vacancies listed as ” taking permanent housing units off the market”. yet they provide no evidence for that dubious proposition. I think the two markets are discrete and segmented. If I am a landlord and want to exit that business, as many do because of the rules, then I am going to sell as TICs. I am not going to Ellis and then re-rent short-term which, in any event, is already illegal under the provisions of Ellis. I think these guys are looking for a culprit where one doesn’t exists. the reason that long-term rentals are declining is because the constraints of rent control make it unattractive. It’s not because, quite independantly, some of us prefer to do short-term lets for a variety of reasons. Correlation is not causation and i see no direct link between the sharing economy and the failures of the city’s housing policies. Yeah, rent control is the real problem. Probably born in Kenya, too. Mass eviction, now that’s attractive! Are you seriously suggesting that Ellis Act evictions and the desire to do short-term lets are somehow magically unrelated to stringent controls on rents and evictions? Just the side effects of an oppressive rent control system. Wha’ddaya expect? This selfish city makes landlords into segregated untouchables who’s property is seized and then by force, rented to strangers for pennies on the dollar and then they wonder why they look for other ways to actually profit from their properties. I wish all the rent control addicts would be saddled with salary/work control and would have every aspect of their employment (if they even have a job) controlled by the salary control board. I can’t believe that a group is retaliating by working on a study to show the percentage of rent controlled tenants make over $100,000 a year, with the year they rented to show a close guess of what they are paying. They claim it will show how many tenants take up apts and don’t need them, are taking up apts which could be rented instead to people needing affordable housing.